When I came to Boston one day in February 1988, I did not know that it would be the start of a love story. Since then, I have landed on Logan International Airport more than 20 times, and learnt to love this old US city. In 1988 I came to visit my dearest friend Joseph Cice, then a Harvard graduate, sadly killed in a car accident in California May 9th 2004. We stayed in his lovely flat in Banks street, close to Harvard University, for a week. The same February I met my American family again, and we just connected. So , on Saturday night, European time, I will land in my beloved Beantown (the home of Boston Baked Beans) once again. I have lost track of alle the places I have been, what sights I have seen, and where I have eaten these last 20 years. I have had great meals at Grendells Steakshouse close to Harvard Square, and at the mother of all Bertuccis Brick Oven restaurants and John Harvard's Brew House in the same neighbourhood, long before they both spread out over New England, as franchise restaurants. I have enjoyed Italian meals to die for in the North End, a place you can close your eyes and absorb the sounds and smells of Italy. The Ware Collection of Blascka Glass Models of Plants is a collection of glass models of plants made from 1886 by Leopold Blaschka and his son Rudolph. You are totally captivated by the collection of life like fake flowers at Harvard Museum of Natural History. When you are at Harvard, use time around Harvard Square. Here you find some very old buildings, like the Massachussets Hall (1718), or you can visit one of the great bookshops. I highly recommend the Harvard Coop, a feast for the book worm. Go visit the oldest building in Boston, the Paul Revere House, once the home of the hero from the American revolution, built in 1680. When you are in the North End, visit the Old North Church, the oldest church in the city, that also played an important role in the American revolution. You can relive the citys role in the Revolution by taking the whole Freedom trail, from sight to sight. One of them is the Old Corner Bookstore (image) on the corner of School and Washington Street. It was built by Thomas Crease in 1718 for his apothecary shop and as his residence. In the 19th century it was the gathering place for authors living in Boston, as: Henry Wadsworth Longfellow, Ralph Waldo Emerson, Nathaniel Hawthorne, Henry David Thoreau, Harriet Beecher Stowe, Charles Dickens and Oliver Wendell Holmes. Where to eat? 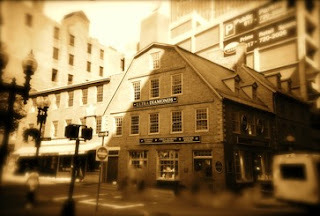 Visit Quincy Market for a snack, or visit Green Dragon Tavern or Bell in Hand for a pint in historic surroundings. Eat Italian in the nearby North End, where you find hole in the wall restaurants, serving scrumptious seafood or good pasta dishes. Newbury street in the Back Bay, is another great deal. But Boston is the home of so many good places to eat. Check this site for your quest . Boston Hidden Restaurants will give you the place where you can get the ultimate Boston grub!! Boston, and the surrounding area will be my home the coming weeks. I will give you my memories when I return. It will explain the news drought from Saturday evening!! I REALLY love that picture! It is such a nice shot, imagine that it was done with a digital camera!